JAKARTA (26 August 2018) – Indonesia’s Anthony Sinisuka Ginting continued his sensational run in the Asian Games men’s singles competition with yet another dazzling display in the quarterfinals, this time against fifth seeded Chen Long, today. Anthony, who sent second seed Kento Momota crashing out yesterday, won 21-19, 21-10 this afternoon to advance to the semi-finals. Another upset result came in the women’s doubles when Yuki Fukushima-Sayaka Hirota, the world No.1 ranked pair, fell to third-seeded Chinese duo, Chen Qingchen-Jia Yifan in the semifinals. 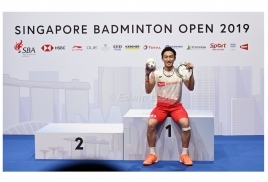 Earlier, Anthony’s teammate, Jonatan Christie made it a double celebration for the hosts when he worked his way past Vincent Wong Wing Ki 21-11, 21-18 to also make it to the last four. The Indonesian shuttlers are at different halves of the draw and should they both win tomorrow, the fans could be treated to an all-Indonesia men’s singles final on Monday. Ranked seventh, Anthony, who had a 3-2 head-to-head record against Chen Long prior to today’s game, will face Chinese Taipei’s Chou Tien Chen, the fourth seed here, tomorrow. Jonatan will battle Kenta Nishimoto, who had shocked third seeded Son Wan Ho of Korea, in the other semis clash. Jonatan, ranked 15th, quickly wrapped up the first game 21-11 but Vincent turned up the heat after that and chased his rival down. They were tied at 12-all and later 18, then Jonatan made a final push and came away the winner at 21-18. Meanwhile, Chou had beaten Angus Ng Ka Long Angus from Hong Kong 21-18, 21-18 in another quarterfinal tie. In the men’s doubles, Indonesia knocked Malaysia out in two quarterfinal matches today. World No.1 Marcus Gideon-Kevin Sanjaya Sukamuljo sent Olympic silver medallists, Goh V Shem-Tan Wee Kiong, packing 22-20, 21-19. Earlier, the Fajar Alfian-Muhammad Rian Ardianto swept past Malaysia’s Ong Yew Sin-Teo Ee Yi 21-17, 21-13 to book their place in the semi-finals. For the Malaysians, the doubles defeats today mean they end the badminton competition here without any medals to show. “Today were focussed on getting the points and reduce the number of possible mistakes. It all worked out well and now we need to look towards preparing for the semi-finals.” Marcus-Kevin will be up against Chinese Taipei pair, Lee Jhe Huei-Lee Yang, who had defeated Koreans, Choi Solgyu-Min Hyuk Kang 21-17, 19-21, 21-17. Second seeded Chinese pair, Li Junhui-Liu Yuchen faced little opposition from their Sri Lankan rivals, Sachin Dias-Buwaneka Goonethilleka to book their place in the quarters after securing a 21-12, 21-16 win. India’s Saina Nehwal meanwhile upset fourth seed, Ratchanok Inthanon of Thailand 21-18, 21-16 to make her way into the semi-finals where she faces a tough battle against Tzu Ying. Saina’s compatriot, Pusarla V Sindhu also advanced with a less convincing 21-11, 16-21, 21-14 victory over Thailand’s Nitchaon Jindapol. With Saina and Sindhu sure of at least bronzes, India will therefore win their first women’s singles medal in 36-years. The women’s doubles was a shocker as the Yuki-Sayaka, consistent in the team event where they won the gold, were out of sorts today and lost 21-17, 21-8 to the Chen Qingchen-Jia Yifan. In the other semis battle, Greysia Polii-Apriyani Rahayu, seeded fourth, played their hearts out but were unable to get past the solid defences of Misaki Matsutomo-Ayaka Takahashi. The second seeded Japanese won 21-15, 21-17. In the mixed doubles, world champions and topseeds Zheng Siwei-Huang Yaqing defeated third seed, Tontowi Ahmad-Liliyana Natsir of Indonesia 21-13, 21-18. 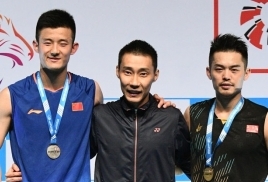 In tomorrow's final, they will meet Tang Chun Man-Tse Ying Suet of Hong Kong who upstaged Wang Wilyu-Huang Dongping of China. 4-Tang Chun Man-Tse Ying Suet (Hkg) bt 2-Wang Wilyu-Huang Dongping (Chn) 22-20, 19-21, 23-21.